Virtually anonymous today, Joseph Leidy was one of the foremost American scientists of the 19th century. He lived at a time when his native Philadelphia was making a slow and sometimes painful transition from patrician elitism of the revolutionary years to industrialized egalitarianism. The transition was good for Leidy, the son of a sign painter, and good for science, too. Beyond his preeminence in human anatomy, he made landmark contributions to botany, parasitology and paleontology. Leidy was born in the 1820s to a German family in Philadelphia. He was still a toddler when his mother died giving birth to a younger sibling. Not long afterwards, his father remarried — his mother's cousin. She was no evil stepmother; by all accounts, she adored little Joseph as much as any of her own babies. Worried about the dreamy, slightly fragile boy, she and Joseph's father hired a "responsible companion" who could keep track of him and fend off bullies. In 1846, Leidy identified Trichina spiralis — the wormlike creature that caused the dangerous and sometimes fatal trichinosis — in pork. He saved hundreds of lives by recommending cooking pork at a high enough temperature to kill the organism. In 1858, he examined the first relatively complete dinosaur skeleton, Hadrosaurus foulkii and suggested that it had a bipedal stance. He frustrated some of his readers by refusing to speculate about the life habits of the animal and consequently writing a profoundly dry, unexciting monograph. Leidy identified other dinosaurs: Deinodon, Trachodon, Troodon and Palaeoscincus. Leidy was one of the first American scientists to accept and defend Darwin's theory of natural selection. Years before Darwin published On the Origin of Species , Leidy realized that environment could affect organisms in positive and negative ways. After Darwin published his theory, Leidy enthusiastically welcomed the new system for understanding relationships between living things, an enthusiasm that drew occasional accusations of atheism. Why did Leidy fade into obscurity? Partly because of his modest nature. He was a tireless worker, but gracious about allowing others to enjoy the credit. A kind of old-school, self-taught gentleman naturalist, he didn't care for noisy public disputes. He disliked competition and after being awarded a professorship, he vowed that he would never compete for such a position again — and he didn't. Also, he was a purely descriptive scientist, shying away from stating bold theories that might have won him more recognition. 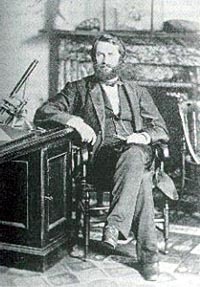 Despite the important discoveries he made in the field, he eventually withdrew from paleontology, and his contributions were seldom acknowledged by either of the famous feuding paleontologists, O.C. Marsh and E.D. Cope, even though Leidy had mentored Cope. In fact, the Cope-Marsh bone wars disgusted Leidy, not only because of the noisy accusations, but also because their bidding wars with each other made fossil bones expensive where they had previously been free. Leidy was a man of contradictions. He was generous with individuals, but harsh with groups, thinking the general public ignorant and ungrateful. Raised by an ardent abolitionist, he opposed slavery but (like many scientists of his time) never questioned the superiority of whites over people of color. That was especially ironic, considering Cyrus Burris, the companion who protected Leidy as a boy, was black. Leidy complained vehemently about pollution in the Philadelphia water supply, yet maintained a long and apparently friendly correspondence with a Mississippi doctor, Duncan McFarlane, who openly admitted to conducting dangerous parasitology experiments on human subjects without their knowledge or consent.